2018 was an interesting year to fly, if not a good year to explore new places. Instead of visiting new airports, I pressed the Warrior into service as a commuter between Michigan and New York. Flying the same route twenty four times between my current and childhood homes highlighted how weather can twist the same path into a very different experience each time, requiring me to manage darkness, rain, turbulence, IMC, thunderstorms, and icing. Even the routing varied according to the whimsy of ATC. Until I had this experience, I would have never suspected that flying so many trips between the same places would have been such a rich learning experience. My first dog rescue flight. Return flights to three of the most interesting airports that I have ever visited: Alton Bay Ice Runway (B18) in New Hampshire, Billy Bishop Toronto City Airport (CYTZ, Toronto, Ontario), and Burke Lakefront Airport (KBKL) in downtown Cleveland, OH. A near emergency when the Warrior's fuel burn drastically increased. My new super power: mowing two lawns 300 miles apart in the same day. Exposure (sadly, no PIC time) to aviation in Alaska, which included my first flight in a seaplane from the incomparable Lake Hood Seaplane Base and a helicopter flight ending in a glacier landing. 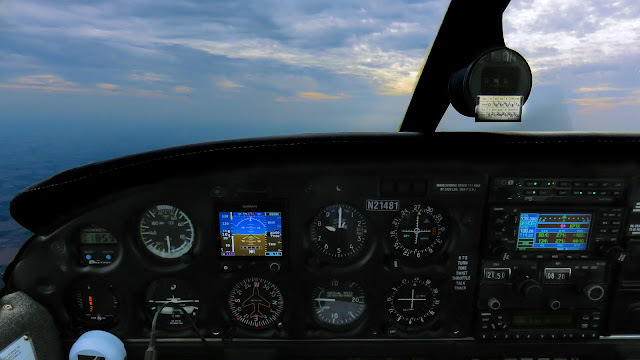 Obtaining a pop-up IFR clearance for the first time (and also a second time that was unsolicited and a third time that generated a clearance all the way through Canada). Cross country vacation flights to see Hamilton and spend Thanksgiving with family. The Warrior continues to evolve with the addition of a Garmin G5 attitude indicator and, less conspicuously, a new alternator (after alternator woes going back years) and starter. I have to say, the new starter is much more spry than the original. Fun flights with the Williamson Flying Club that included attending Airport Day at the Oswego County Airport, two breakfasts at the West Wind (St Marys, PA), flying back seat in a Champ to breakfast at Whitford's, our annual pilgrimage to Lake Placid, exploring the USS Cod in Cleveland, and a no-frills breakfast in Dansville. I have come to greatly appreciate the camaraderie of the WFC community that I joined in 2013. Finally, the end of 2018 saw The Bear taking the controls of Warrior 481 for the first time since 2014! 156.9: Total number of hours flown in 2018, my highest annual total ever. I completed 2018 with 1904.0 total flight hours logged. 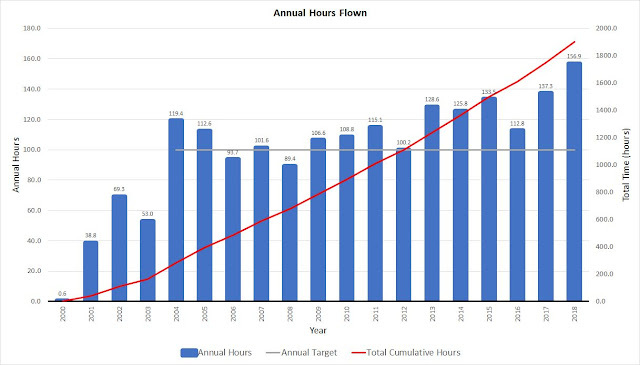 Since buying the Warrior in 2004, I have targeted 100 hours per year. 11.1: Total number of actual IMC (instrument meteorological conditions) hours flown in 2018. This is also my highest to date in a single year. I now have a total of 46.4 hours in IMC. 66.8: Hours spent commuting between Sodus and Oakland County International (KPTK), 43% of my 2018 flight time. This time does not include the two rides I flew out of Pontiac, nor our post-Thanksgiving stop at KPTK on the way home from South Bend. 50.7: Quality hours spent with The Bear on board Warrior 481. The Bear completed 2018 with 451.0 total hours logged since birth. When it comes to General Aviation, she is a well-flown bear. 7: The number of states and provinces visited in 2018 (IN, MI, NH, NY, OH, Ontario, PA) with no new additions to the list, sadly. Alaska does not count because I did not fly myself there. 3: Only three new airports visited in 2018. Is it any wonder that I've ended 2018 itching to visit some new places? 25: The number of people that came along for the ride in 2018. Thanks to Tom C, Ed C, Jamie O, Dave P, The Bear, Kristy, Mom, Max K, Lesly J-L, Dougall (dogs are people too, right? ), Chad M, Ken F, Brenda V, Tre'vyon, Lee S, Paula S, Armelle F, Madalenn F, and seven others from the community who rode with me in One Delta Tango at the Apple Blossom Breakfast. Particular thanks to Tom C, Ed C, and Dave P for acting as safety pilots during instrument practice this year. I have always said that a sizable portion of my fascination with flight is visual. Here's the proof, my favorite images from 2018. Final, runway 10, Williamson Sodus Airport (KSDC). This is what coming home looks like. Over the Mendenhall Glacier near Juneau, AK. Photographed from a helicopter operated by TEMSCO. Short final to runway 01 at the Alton Bay Ice Runway (B18). Photo by Ed C.
For the first time in four years, The Bear tentatively reached for the yoke and held it gingerly with both hands. "The airplane is yours," I told her. She continued on course along the Lake Ontario shoreline, countering the occasional bumps that caused one wing or the other to dip earthward. But it was banking the airplane into a turn that eventually summoned a triumphant smile to her face. The Bear has been flying in Warrior Four Eight One since she was five weeks old, and she made her first cross country flight from Le Roy, NY to Kalamazoo, MI just a few weeks later. 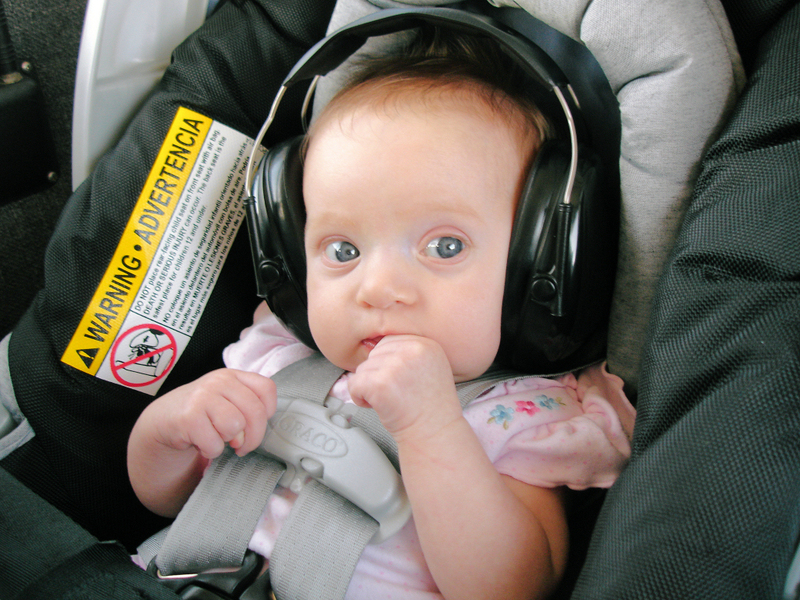 She has been immersed in aviation her entire life. At the tender age of two and squarely in her "caveman syntax" phase, she was known to make requests such as, "Me fly in the Daddy airplane?" The Bear was very excited by her first steep turn during her first flight in the front seat. July 30, 2011. On her first promotion up front from the back seat, we discovered that she loved steep turns. "Wow! That was some turn!" she exclaimed. That she would one day take control of an airplane in flight was an inevitability. I waited patiently for her to grow tall enough to see over the glareshield. The Bear's first time at the controls. September 1, 2012. The moment she first bent the airplane to her will was a truly exciting milestone for both of us. Making Kristy nauseous at 3,000 feet. May 11, 2014. To my surprise, The Bear's last time on the controls was Mother's Day 2014, flying back to Sodus from breakfast at the Oswego County Airport. She simply hung up her headset and refused to take the controls again. "Does she fly your airplane?" Jill Tallman from the Aircraft Owners and Pilots Association (AOPA) peered at The Bear hovering shyly behind me. It was an unusually warm and sunny November day in 2017 and the Williamson Flying Club was hosting AOPA in preparation for a feature story about the club in AOPA Pilot. I shook my head and explained that The Bear was spooked a few years previous when some mild turbulence caused the airplane to behave unexpectedly while she was at the controls. She went left, but the atmosphere banked the airplane right. This so unnerved her that she had gone without touching the controls ever since. My daughter is a lot like me. She wants to do things at her own pace and pushing her to do anything she does not want to do usually draws the process out even longer. I had decided not to push knowing that she would come back to it on her own someday. As I explained this, I saw the glint of interest fade from Jill's eye and we moved on to other topics about the club and the airport. "Dad, can I fly the airplane again one of these days?" It was December 2018, four and a half years since her last time on the controls. She had finally turned the corner. We launched December 27, 2018 for what was likely to be our last time aloft in 2018, me with my heart beating a quickened rhythm, The Bear eagerly clutching her camera. Before we departed, Williamson Flying Club instructor Mike warned her not to hit that rare, bright shiny thing in the sky. "He means the sun, doesn't he?" she muttered at me with a full-on derogatory pre-teen tone. I was not looking directly at her at the time and can only infer the eye-roll. "Yes, sweetie, he means the sun." Hey, it's Upstate New York. Appearance of the sun at this time of year is a noteworthy event. We climbed to 2,500 feet and flew along the Lake Ontario shore from Sodus Bay to Chimney Bluffs. As we flew, The Bear busily snapped photos. A local marina. Photo by The Bear. Island in a field. Photo by The Bear. Flying westward toward Rochester, I surrendered control of the airplane to The Bear. She was tentative, but knew what to do. She followed the Lake Ontario shoreline, making gentle corrections to keep the airplane on course, sometimes correcting for the imperfect atmosphere, sometimes for the rambling shore. At The Bear's request, I agreed that we could fly over our house. We do not do this often because it is under Rochester's Class Charlie airspace. I called ATC with radial, distance from the Rochester VOR, and altitude to circle. This was granted and, with me back on the controls, we made a single pass over our house. We exited Rochester's airspace to the east and I asked The Bear if she wanted to fly again. "Not really," she answered. But her second thoughts came so quickly that her hands were already reaching for the yoke. I grinned and removed mine. "Your airplane." Beaming, she directed our ship eastward along the shore. When the Warrior began to oscillate in pitch, I glanced at her only to find a devilish smirk on her face as she worked the controls fore and aft. She was not only comfortable back on the controls, she was actively toying with me. It was time to stretch her wings a bit further. "Want to circle? Any direction you want," I encouraged. "No," she declared, but then second thoughts caught up with her yet again. "What would I have to do?" "I'm not asking for a loop, just a complete circle. You can go left or right." She chose a right turn out over Lake Ontario. "That was really fun!" Her smile rivaled the radiance of the sun (which, somehow, we managed to avoid hitting per Mike's recommendation). The Bear's favorite bridge (yes, she has a favorite bridge in town, the "Freddie-Sue"). Photo by The Bear. When I reported five miles out for the Williamson Sodus Airport, my call was answered by Darrell from the base station in the Le Roy Airport office. "Wait...what?" I broadcast in surprised response. I have not seen much of Darrell since he moved to Florida. So, just ten minutes after dropping flight following with Rochester, I was back on with Approach requesting a VFR transition of Rochester's airspace to Le Roy. Landing on runway 10 in a rare easterly wind, I could not help but reflect that it was the same runway (and direction) on which The Bear first landed as an infant over eleven years ago. It made for nice symmetry on this day of aeronautical reboot for The Bear. We had a great reunion with Ray and Phil, Darrell and his family, and Ron (one of the other Le Roy pilots). It was The Bear's first time landing at the Le Roy Airport since we moved to the Williamson Sodus Airport in 2013. No one could believe how tall she had become. Final approach, runway 10, Williamson Sodus Airport. Photo by The Bear. When we packed the airplane away back at Sodus, it was with a sense of great accomplishment. We had regained what was lost. The Bear had tamed her fear and forged new confidence for later forays into the sky. I knew she'd come around eventually. More than any words that I can offer, the success of the day is best summarized by The Bear herself, who took this selfie as we entered the pattern at the Williamson Sodus Airport. Happy kid, grateful father, time well spent in our airplane; a perfect close to 2018.